There are certain things that one can tell by a person when they make food pronouncements. For instance, I would comfortably describe all of the vocal vegans I know as dour, I do not trust people who have never had a drink and proclaim to not like alcohol, and people who do not like chocolate have no soul. Now that I have offended some people (and before you send me your emails full of sweeping generalizations about sweeping generalizations, keep in mind that while you will take hours crafting a finely worded, well thought out missive explaining the many ways in which I am wrong, I will spend several nanoseconds pressing the delete button without suffering the pangs of conscience you intended to produce), let’s move on to chocolate mousse. While this is a decadent treat that no person should come to the end of their life without trying, it has to be said that it contains raw egg products and there are people who believe that consuming raw eggs may kill you. This is, in point of fact, true. If your eggs come from a factory farm where the chickens are limited to a one foot cube and live in an enclosed space with 35,000 other chickens with poor ventilation in the poultry equivalent of the Amistad before the mutiny, you run a good chance of picking up some kind of pathogen, most likely salmonella, which will cause you to become violently ill, potentially killing you. Rather than denying yourself such a tasty treat, perhaps you should consider buying good eggs from good people who treat their fowl well. If you are using block chocolate, chop it up into smallish pieces. Put enough water in the bottom of the double boiler so that the water almost touches the bottom of the top bowl. Put the bottom of the double boiler over a medium high flame on the stove and bring it to a slow boil. Put the chocolate in the top of the double boiler (the pyrex bowl if you are going that route) and pour the espresso (or coffee) over it. Put the top of the double boiler on the bottom and, stirring constantly, melt the chocolate. Once it is melted and combines with the espresso (coffee), pour the mixture into the a large bowl. Add the scotch/bourbon and mix. Using a stand mixer, hand mixer, or whisk, beat the egg whites until they hold soft peaks. Continue beating, adding the confectioners sugar in 1 tablespoon increments until the egg whites hold stiff peaks. Using a stand mixer, hand mixer, or whisk, beat the cream until it is whipped cream (be careful not to make butter). Using a spatula, gently fold the eggs into the chocolate mixture in 3 or 4 batches. Once the eggs are incorporated (you should see no streaks of white in there), fold in the whipped cream. 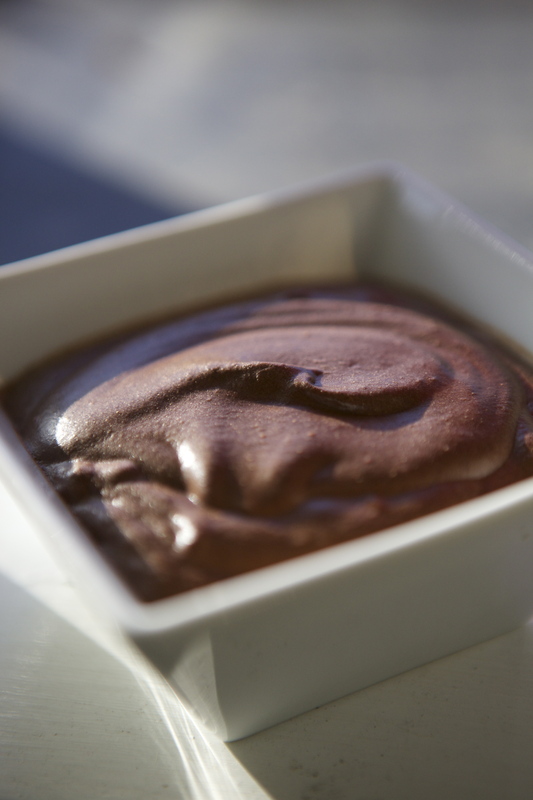 Distribute evenly into your serving dishes and refrigerate for at least 3 hours to let the mousse set. You may choose to cover the bowls with plastic wrap but it’s not required. If you want to pretty up the presentation you could sift confectioner’s sugar over the mousse, whip another 1/2 cup of heavy cream and plop and artful dollop on each serving, use a microplane to shave some extra chocolate on top, or even decorate with a carefully arranged sprig of mint.